Saudi Arabia’s Bureau of Investigation yesterday contacted Samar Badawi (above), the wife of Waleed Abulkhair and sister of Raif Badawi, and asked her to report to the Bureau at 10:00 a.m. February 15. She reports that no reason for the summons has been given. On January 12, 2016, she was arrested and released on bail one day later. She was charged with operating her husband Waleed’s Twitter account. Samar Badawi is the sister of Raif Badawi, the human rights writer who was convicted of apostasy and other charges and sentenced to ten years in prison and 1000 lashes with a cane. Waleed is Raif Badawi’s lawyer as well as his brother-in-law, and he is in prison for his human rights advocacy as well. Because no reason for the summons has been offered, Samar of course can not prepare for the questioning. This is a common form of judicial harassment in nations that use a judiciary as a tool to intimidate. I received a call from the Bureau of Investigation in Jeddah to summon by 10 a.m day after tomorrow, no specific reason was given yet. Samar has been an activist like her brother for years (both are in their early 30s). As a teenager, she fought for the right of women to leave abusive families, even as her father filed charges against her time and again; then she fought for women’s suffrage; then she was a part of the campaign to get women driving in Saudi Arabia. The U.S. State Department honored her with a Woman of Courage award in 2012. 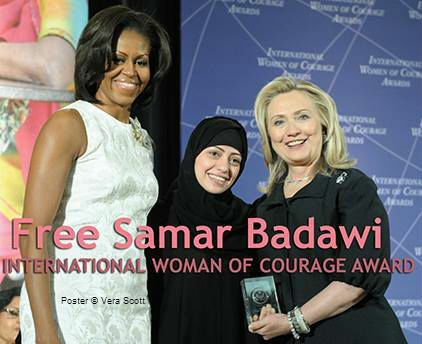 Michelle Obama, Samar Badawi, Hillary Clinton, 2012. Ensaf Haidar left Saudi Arabia with her three children in 2012 and human rights advocates helped her find a home in Quebec, Canada. She and the children have been building a life there, learning English and French, while Ensaf has traveled the world making people aware of her husband Raif’s story, his words, his life. Samar remained in Saudi Arabia with her children, and like Ensaf, she did not lay low but instead continued the peaceful fight for human rights that she and her husband always supported with words and actions. Saudi Arabia revoked her passport on December 3, 2014, which is never an indication of good things to come. She has faced harassment ever since. Human rights organizations like the European Saudi Organization for Human Rights (ESOHR); ESOHR’s director, Ali Adubisi; and Front Line Defenders have already published posts similar to the one above to make human rights defenders around the world aware of Saudi Arabia’s ominous request for Samar Badawi.